The import wizard fails with a generic error. Some customers using the import wizard may encounter difficulty importing one or more files even though all of the data is correctly formatted and all required fields are present. The user will typically receive an email that an error has occurred and to either try your import again or contact Salesforce. This is not always indicative of this issue, other problems like not providing data for required fields or trying to update or insert duplicate values to unique fields can also cause this. Support can verify if this is the cause or if it is another issue. Also please be sure to follow this Known Issue for notice on permanent resolution of this issue. We've determined that the way to resolve this problem is to build a new import wizard that is re-architected from the ground up to be as robust and future-proof as possible. This new data import wizard will be generally available in Spring '14 as an alternate to the old wizards. Look for it in Setup at Data Management | Data Import Wizard. It will never experience this row-by-row problem. 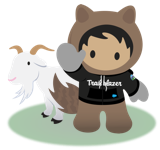 The old separate import wizards for accounts, contacts, leads, solutions, and custom objects will remain available, unchanged in functionality, until they are eventually retired.